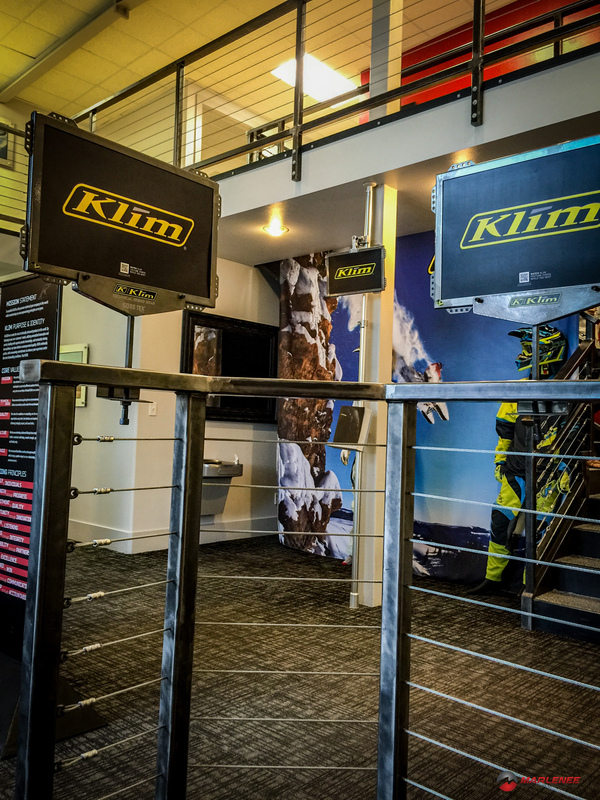 A pilgrimage that every sledder needs to take is to visit the Klim factory, regardless of what gear you wear. 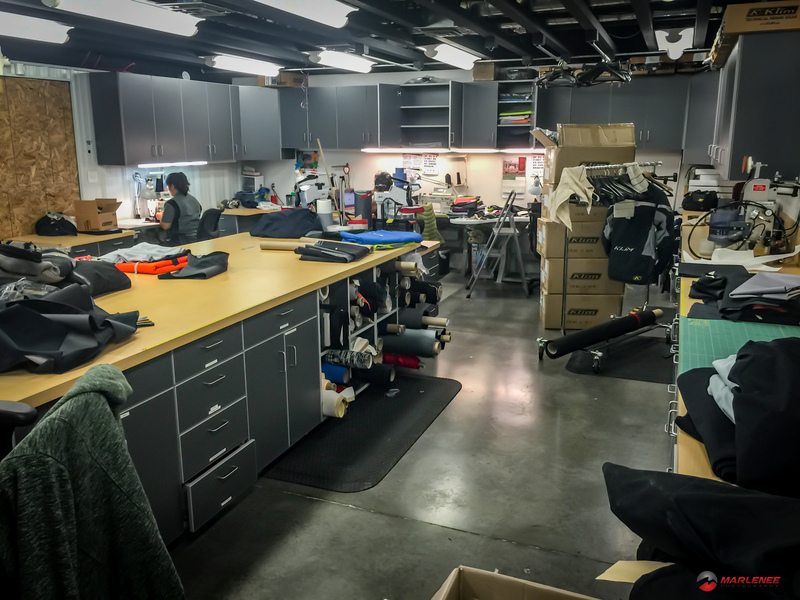 They’re the only industry-specific clothing manufacturer using Gore-Tex, they have super-tight quality control, and the atmosphere and campus are just awesome. Plus, it’s a great story of success from a grassroots level to top of the segment! And, if you’re in the area, they love to show folks around, so it’s worth a stop. Just a few weeks ago, I got a call from Klim’s Snow Marketing Manager. Enthusiastic about my contributions from the previous year, he wanted to discuss getting a better plan for content this year, and it just made sense to do it in person. To say the least, I was excited. Not only did this upcoming meeting have the potential for some great exposure, but it also was a chance to finally put a face to countless email addresses, and to check out the entire Klim process. After work, late on Tuesday night, I hopped in my Dodge Megacab and hit the road. It is 554 miles from my house to the Klim factory, outside of Rigby, ID. Initially, my plan was to drive to Pinedale, WY and grab a room for the night. At around midnight, I rolled through Pinedale; I was feeling good, so I decided to keep going. Alpine was just 30 more minutes, and made sense. Between Alpine and Pinedale, there’s pretty much zero service. As I exited the canyon, my phone came alive with service. I raced to get GoogleMaps opened, and to find a hotel, but it wouldn’t load. Almost by habit, I pulled into the Flying Saddle Resort, as I’ve stayed there dozens of nights, filming with Thunderstruck. No Vacancy, a hand-written sign said, posted on the door. Crap. Finally, GoogleMaps opened. I systematically dialed each motel on the list. Now, after 1 AM, I got a mix of “sorry, no rooms” and simply no answer. I figured I could just head to Idaho Falls and grab a room. The hour drive to Idaho Falls only gave me enough time to find out that there were no rooms in Idaho Falls, either. The terror of not sleeping was starting to set in. In just a few hours, I was to have one of the most important meetings of my industry experience, and I was looking at a night in the Hotel de la Dodge. Finally, I was able to locate something in Rexburg. The nice lady on the other end of the line did caution me that their only room left was the honeymoon suite. I didn’t care. Another long hour later, I arrived in Rexburg. Upon stumbling into my room, I noticed things were off, but I was too tired to care. I fell onto the bed, face first, completely clothed, and was instantly asleep. It was 6 AM and my phone was ringing. I awoke in a panic. Where was I? How did I get here? What was going on in this room? From the tiny sliver of light that was able to penetrate through the thick drapes, I could tell something was awry. Ahh, it all started coming back to me. I pulled myself together and opened the curtains. 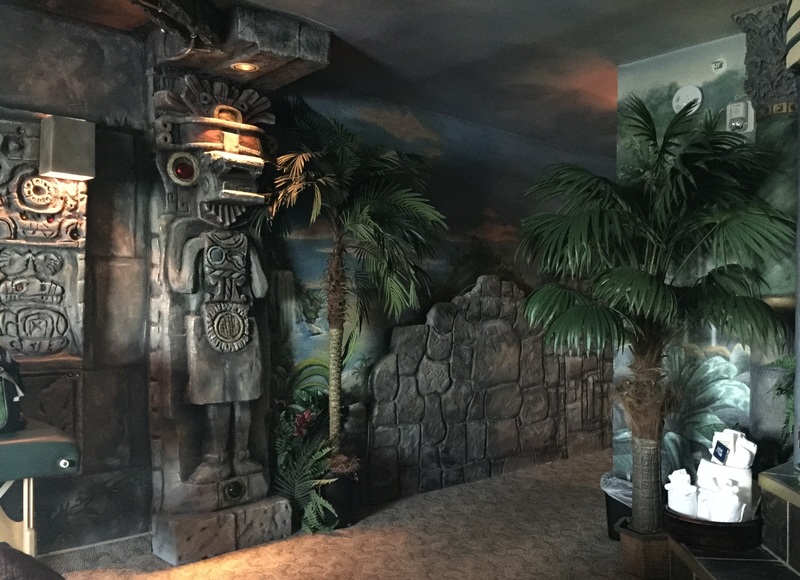 Blinded by the light, it took me a moment to accept that I was standing in a faux-Mayan jungle. After ten minutes or so, it finally sunk in, and I was able to take a shower. The drive to the Klim factory was only a few minutes from Rexburg, and I had little time to think or let anxiety get to me. As I pulled in, the grounds were under construction; Klim was undergoing yet another addition. I found my way around the construction and located the front entrance. A nice lady greeted me and asked me to sit while she located my tour-guide, as the intercom was also dysfunctional due to construction. I plopped down on the comfy red arm-chairs and admired the shrine of all things sledding. There were dozens of pictures on the walls, accompanied by various hoods and other items of interest. Soon enough, I was greeted by my rep who was as enthusiastic to show me around as I was to learn and see. We started at one end of the building, where he told me how the whole thing started. A young man at the time, Justin Summers was on a mission in Taiwan, where he made some great connections with some textile manufacturers. He brought his knowledge and connections back to college where he became known as the ‘Coat Guy’. Sometime later, Justin came across a quantity of non-current Gore-Tex fabric. He bought enough material to make gear for a few years. He got to work with his seamstresses, and built a small inventory. It lasted not quite two years and he ran out of Gore-Tex with no way to buy more. He was determined to build a product with a “lifetime warranty”, what would he do? Justin scoured the textile world, looking for an acceptable substitute for Gore-Tex. At the same time, he relentlessly worked on the folks at Gore-Tex to become a certified Gore-Tex partner. 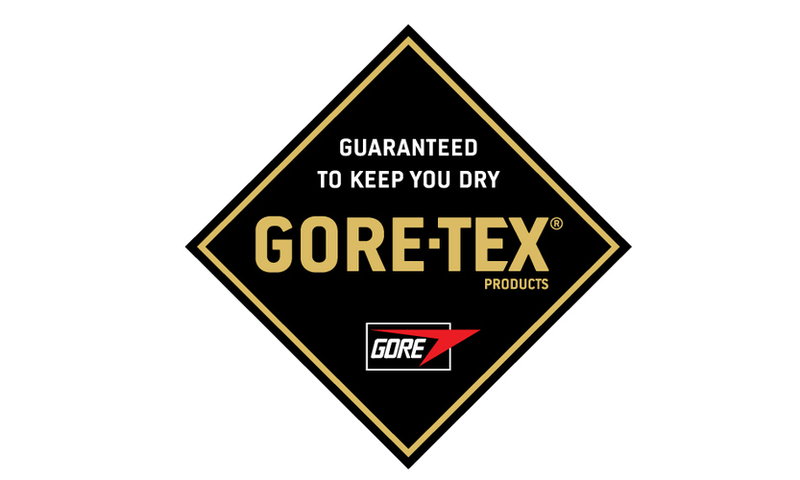 Gore-Tex is extremely strict in every aspect of their business. They control who gets to use Gore-Tex, how new products are approved, which factories make Gore-Tex branded products, and how those products are constructed. While he was waiting for his talks with Gore-Tex to come to fruition, he was forced to use a replacement material in the interim. He settled on a product called E-vent and, again, began producing garments. Initially, Justin and the Klim team were happy, overall, with the performance of E-vent. 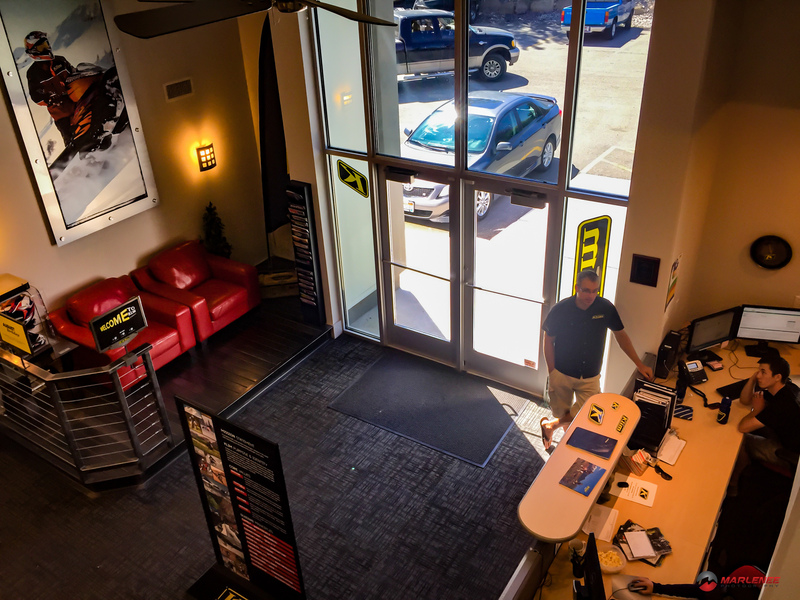 However, as the second season with E-vent got into full swing, Justin and his team noticed their warranty department was very busy. Upon further investigation, it was discovered that warranty repairs were taking a toll on the company at an un-sustainable rate. This left him in a very difficult situation. Luckily for Klim, persistence pays off. Justin’s continued commitment to work with Gore-Tex and his perseverance in pursuing that relationship finally yielded a contract between the two, and that’s when Klim really took off. But it doesn’t stop there, Klim continues to develop new relationships and combine new and existing materials in order to stay on the leading edge of clothing technology. After leaving Justin’s office, we headed down the hall. My tour guide took the time to introduce me to each Klim family member we met as we walked through the corridors. Our next stop was the original board room. My guide enticed my curious mind with a story of how the Klim name came about. Leaving college, Justin Summers knew he wanted to follow his passion of Klim, then called Teton Outfitters. His business school learning left him with an understanding that he wanted a short, powerful name. He wanted a name that correlated to the industry that would resound with his customers. At the time, in the late 1990’s, climbing was paramount in western riding. He honed in on the word “climb” and set about different, unique spellings. Klim was born. My guide took a moment to dispel that although Justin can often be found drinking chocolate milk (never regular milk), the Klim name was not just an epiphany that Justin had while looking at a carton of milk. I was escorted through the design department, and like most New York City fashion firms, magazine clippings lined the walls. Some were glued to poster board, cuing the inspiration for another upcoming season of design. I was surprised to see so much work go into the design, and that Klim is putting out product that isn’t black (although black is really so practical in our industry for gear that lasts for over a year). There was one room designated as the War Room. Inside, a stand-up conference table was headed by a large television and a few white boards. 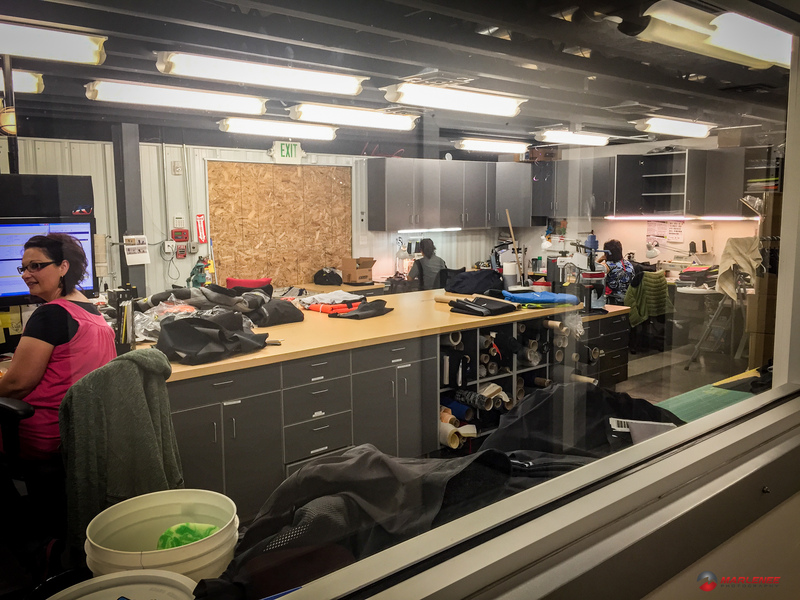 My guide told me that their design process involves each department, because for Klim, design is more than just how the garment looks, it’s how it functions and performs, and how the market will receive it. I was also told of how, when they are designing new products and tuning up current models, they bring in engineers and reps from companies like Cordura and 3M to see if there’s a way that Klim can use some unique blend or construction with additional products to build new technology and assure that Klim is always providing its riders with the most advanced technology available. Next, we swung by the warranty department. Like everything Klim does, they have succinct control and desire to self-perform each aspect of its line. The warranty department consisted of just a few people, happily working behind a double-set of windows, setting a theme like a fish bowl. My guide informed me that two of the seamstresses, both Gore-Tex certified, had been with Justin Summers since the inception of the company, even before the name Klim was born. I took note of their workload. While I wasn’t specifically told Klim’s annual volume, I can assume that they ship tens of thousands of individual garments each year, maybe more. Sitting in cue, were no more than twenty garments. I think that speaks for itself. Our next stop was Klim’s new conference room. It was impressive to say the least, and displayed the entire summer and winter lines, well, maybe not the entire, but enough to fill my mind with want. On the ceiling, were two cinema-quality projectors, and I can only imagine the deals that have gone down in there. I got the chance to see and feel each of the items in the 2015-16 catalog, of which I had so many pictures that were used. 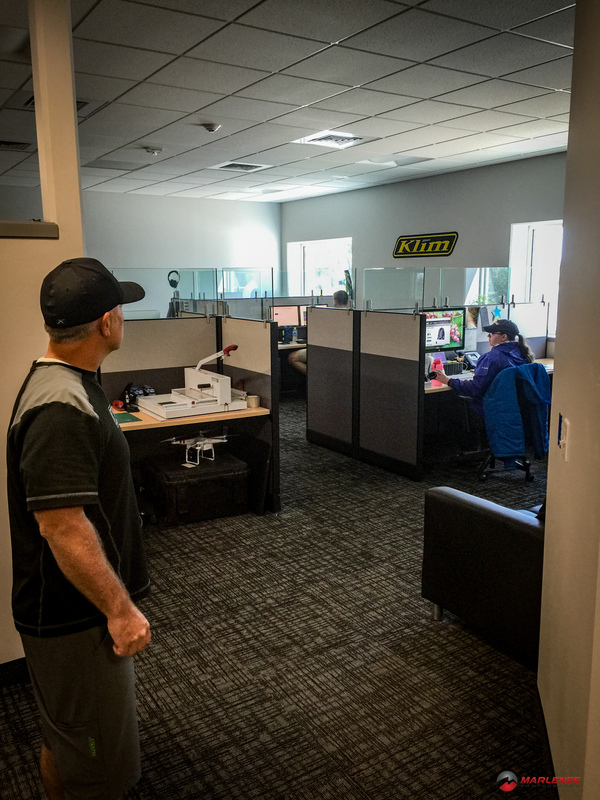 As we walked through the halls, I was very surprised at the distance that Polaris keeps from Klim in allowing Justin and the Klim team to follow their dream and continue down their path of success. Prior to my tour, I’d always figured that since Polaris owned Klim, they’d have a hand in things, or at least have visible co-branding. I expected to see Polaris-specific garments, or maybe sharing some resources like the IT department. However, it seems that Polaris’s intent must have been to keep Klim as it was, and the team intact, because Klim is definitely still Klim. There are posters on the wall of riders on non-Polaris sleds, and even in the catalog you see a cross-brand representation of the industry. I think that’s pretty important to know. Our next stop was the lunch room. My guide explained to me that Klim is a family company, and every other week, the entire company has lunch together. At this lunch, and as a group, they discuss the health of the company, upcoming hurdles, major victories, and product launches. I took a moment to take in a company that works this way. It just seems to me that it is a better place. As we continued on, we moved to the creative department. I was surprised to see a half-dozen folks, contently sitting or standing behind their workstations. The dress code at Klim is casual to say the least. I was way overdressed in jeans and a button-up shirt. The creative department houses their social media guru, video, photography, and illustration. In house, they create their own infographics, as well as media and content for special purposes. I found out that they often supply dealers with specific banners and advertisements that may be pertinent to that specific market. 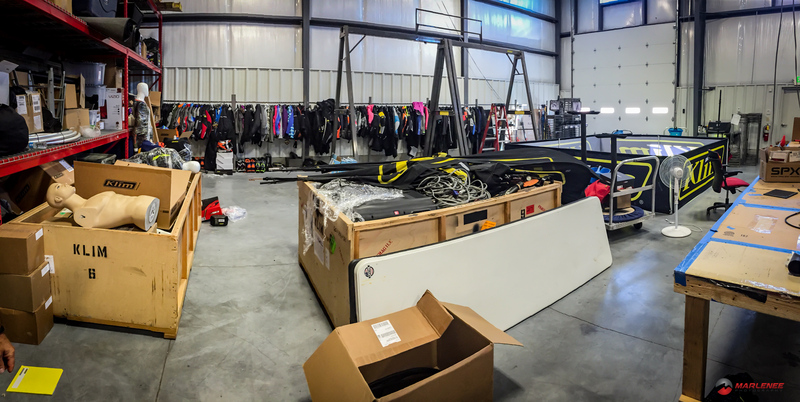 Finally, we made the transition out into the warehouse. I was expecting a bland, traditional warehouse, but like everything else at Klim, I was blown away. At the head of the warehouse sits shipping and controls. My guide, in detail, showed me how they take every precaution to make sure that your order is correct. Each box, after being packaged, is precisely weighed, and compared against their catalog weights to ensure that your box contains exactly what you ordered. It’s checked over once again and labeled for shipping. Turning to look down the aisles, I was blown away by the sheer volume of items. The shelves were stacked 20-feet high. More impressive yet, was that the stocked gear was only inventor replacement. 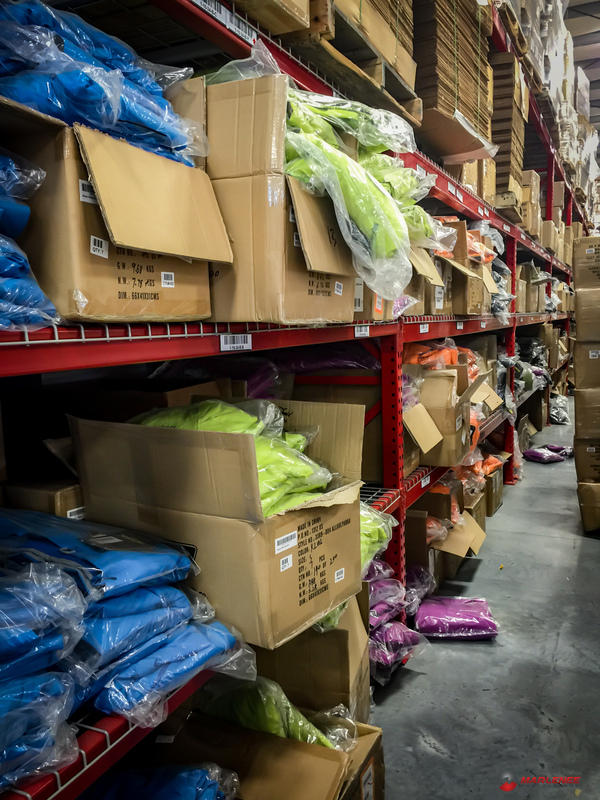 Most of their gear ships directly from their factories, so this warehouse basically supplied internet orders and dealer partners restocking. It was apparent that each of the aisles in the warehouse was yet another expansion to their factory. And, to add the Klim stamp on things, the warehouse employees traversed the lot on skateboards, scooters, and with self propelled fork-lifts. In my line of business, this would be considered horseplay and be deemed unacceptable. However, at Klim, it just fit, and seemed to be very efficient. Scooters were cached all around, and the hum of constant traffic broke up the monotony of warehouse work. I’d say the shelves are stocked! Our final stop was the marketing department’s playground. This room was dedicated to several projects including all of the displays and exciting toys for the upcoming expo season. While I was forbidden from telling you exactly what contests they’ll be holding this year, I can promise you that there is definitely some incentive to visit the Klim booth at your nearest expo! As I wrapped up my tour of Klim, several things were apparent. Klim cares about their product. 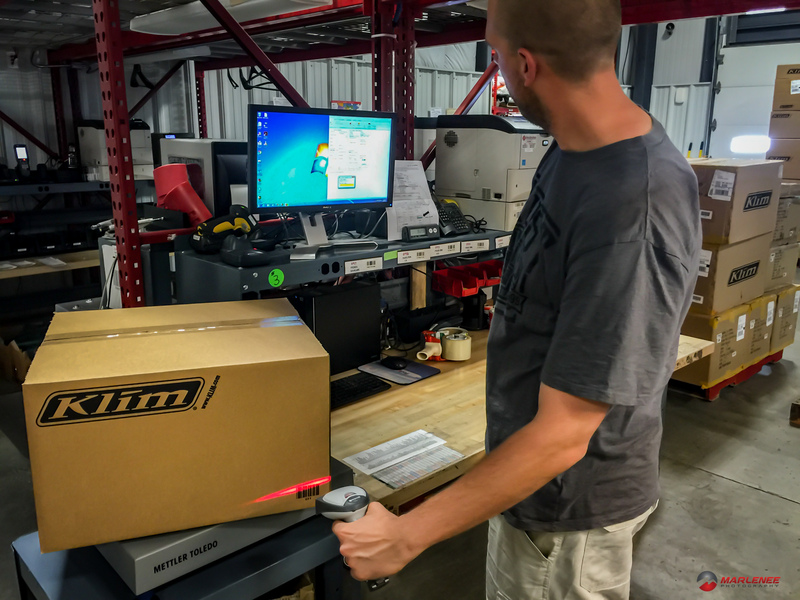 Some casual stories that I’ve omitted further enforce that the team at Klim cares about not only the finished product, but every aspect of every component of every product. They oversee and manufacture each piece in their controlled factories, to very detailed specifications. Add to that the stringent controls that Gore-tex imposes, and you see how they produce the highest-quality garments in the industry. However, this control and demand for perfection is uniquely matched with one of the best work environments I’ve ever seen. All of the employees seem to fit in, and are very happy. And, this leads into one of the things that solidifies why I choose Klim when I’m buying gear: it’s not just a nameless corporation, Klim has dozens of people that care about their products, and go out of their way to build something that you can trust will keep you warm and dry. It was a trip that was well worth it for me, and I’d put this on your list the next time you’re in the area!